I spontaneously took the day off from work on Monday and found myself at Mac's Burgers sometime around 1 p.m. The occasion called for day drinking .. This is the Mac Jack Lemonade ($8). I could smell the booze even before the drink was set on the table and thought maybe this isn't such a good idea after all. (It was a great idea!) Made with Mac's house-made frozen lemonade, this is made for summer. Delicious and refreshing. Other drinks include a Frozen Bellini and the Arnold Palmer Freeze (!). 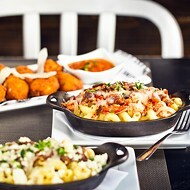 Mac's bills itself as a gourmet mac n' cheese and burger bar. There are 15 burgers and 12 mac n' cheese selections. David Chang wrote a great Burger Manifesto, in which he says "My ideal burger is bun, cheese, burger" — except when it isn't. I admire Mac's creativity in the burger field (same folks own LBOE). 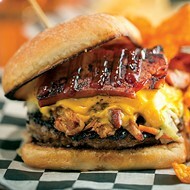 There's a burger topped with hot dogs, one dressed in Fritos and bacon, and one, of course, with mac n' cheese. The most-straightforward burger has a mere three toppings: two types of cheese and butter. 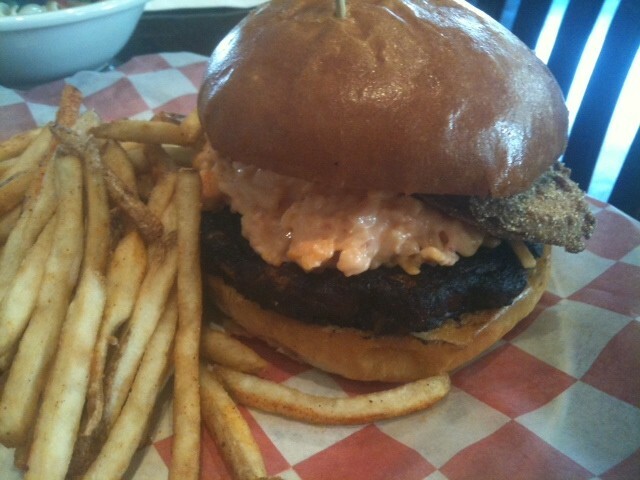 I ordered the Southern Bell ($9.25), which is topped with pimento cheese and fried green tomatoes. All burgers can be ordered with single, double, or triple patties. 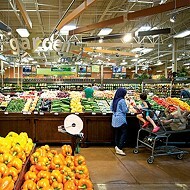 They offer as substitute a spicy black bean burger and turkey burger. I'm pretty sure this is the same black bean patty they use at LBOE, which I like a lot, but it didn't quite work with the particular burger I chose. The spiciness of this patty demands to be star of this show, and this ended up being literally a mess and a mess of flavors. Maybe I'll try the Old School next time. I'm a mac n' cheese fan (who isn't? ), so I ordered it as a side. There is no just plain ol' mac n' cheese; like with the burgers, Mac's pushes it. You can get it with fried chicken, blackened chicken, garlic chicken, grilled chicken, brats, hot dogs, Philly steak, pulled pork, and shrimp ... whew! 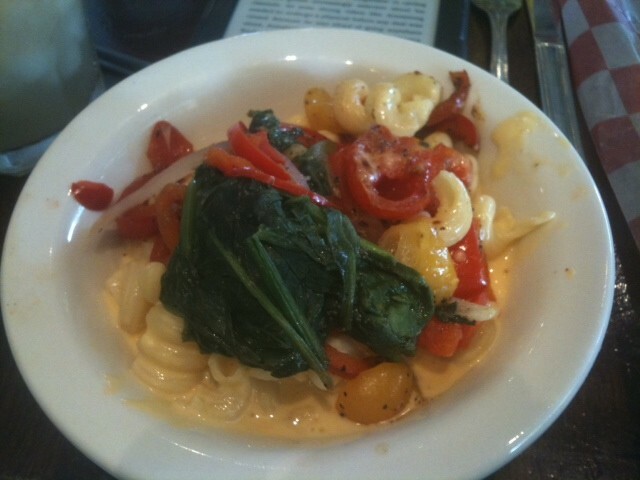 I ordered the Veggie ($8.95, for full dish), and I will say that Mac's does mac n' cheese really well. The sauce was very rich, almost buttery (maybe a bit much for a day creeping up to a 107 heat index) and I loved the spinach. The decor at Mac's is nondescript, making a point that this joint is about the eating and the drinking. You get plenty of space for the latter, as there is a huge wraparound bar — leftover from Dan McGuinness, I'm guessing. Mac ‘n’ cheese is taking over local menus.